Meta is having a Killer App Ideas contest to get people thinking about and then working on applications for their augmented reality glasses, which look to be for sale next April to regular folks. If you like this idea then please vote for it. I propose Greenhouse Glasses. 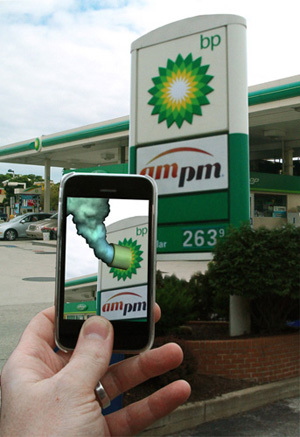 Augmented reality to help us understand and prevent climate change: by seeing power use, greenhouse gas (GHG) emissions, carbon footprints and climate data around us; by mediating our view of reality to show how the region we’re in will be affected by climate change in 2100; and by overlaying objects with factual or artistic climate-related information and interventions. Greenhouse Glasses are a tool to help prevent catastrophic climate change. Here are some of the things the app would do. There are more possibilities, and better ones, but these are a start. Some of this is very possible right now, but some of it will take a fair bit of work, if not in the programming of the AR then in getting the data. When you’re in a car, bus, subway, plane, or whatever, or you’re out walking or riding a bicycle, show how much fuel is being used or saved. Show the bad and the good. Have an indicator rising when you’re driving your car alone—show the cumulative greenhouse gas output so far this month—and then going down when you’re on the subway. It must be easy for devices to figure out when you’re travelling: if you’re moving faster than n km/hr on land then you’re in some kind of vehicle; mapping and GPS would show if you’re on a road; if you disappear at a subway entrance and reappear twenty minutes later at another one then the trip can be inferred; same if you go to an airport and two hours later you’re in another city. Google Now can know a lot about your travel plans too. If it can, this app can. Some configuration will be necessary for Greenhouse Glasses. You’ll need to tell it what kind of car you own, for example. Perhaps you’ll need to specify which bus you take in a commute. Other times it will ask you for a detail or to confirm something (“Did you just take the subway from St. George to Downsview?”) and then it can remember that adapt to your patterns. Recognize devices like microwaves, refrigerators, televisions, furnaces and air conditioners and show how much power they use. This would require configuration, but once you’ve told it what model your fridge is it will know how much power it draws, then it can show that and the carbon footprint on the door. Of course, when you open up the fridge and look inside, you’ll see the footprints on everything inside too. Walk around your house and see power use and carbon footprint information on all of your electrical devices. Turn them off and see how much standby power they draw. Monitor room temperature in summer or winter to show how changing the thermostat by a degree or two could affect power use. Maybe the glasses could suggest changing the temperature by a degree, and if you wave yes it talks to your thermostat and makes the change. Change the colour of something to indicate power use. Make a carpet go red as your home uses more power. There seem to be two problems with getting carbon footprint information on products: it’s hard to calculate and the data isn’t freely available. In the UK Tesco was putting carbon footprint labels on products a few years ago, but it fizzled out. Here’s a bit of what I’ve found out. The Carbon Trust in the UK has done a lot of work on this, and they have “27,000 certifiable product carbon footprints” as determined with a program called Footprint Expert. Maybe it’s possible to use that data? PepsiCo hired experts to do the math, measuring the emissions from such energy-intensive tasks as running a factory and transporting heavy juice cartons. But it turned out that the biggest single source of emissions was simply growing oranges. Citrus groves use a lot of nitrogen fertilizer, which requires natural gas to make and can turn into a potent greenhouse gas when it is spread on fields. Publicly Available Specification 2050-2011 (PAS 2050), the Green House Gas Product Protocol (GHGPP) standard and forthcoming guideline 14067 from the International Organization for Standardization (ISO) have helped to propel carbon footprinting from a subdiscipline of life cycle assessment (LCA) to the mainstream. However, application of carbon footprinting to large portfolios of many distinct products and services is immensely resource intensive. Even if achieved, it often fails to inform company-wide carbon reduction strategies because footprint data are disjointed or don't cover the whole portfolio. We introduce a novel approach to generate standard-compliant product carbon footprints (CFs) for companies with large portfolios at a fraction of previously required time and expertise. 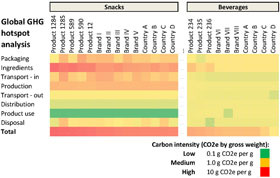 The approach was developed and validated on an LCA dataset covering 1,137 individual products from a global packaged consumer goods company. Three novel techniques work in concert in a single approach that enables practitioners to calculate thousands of footprints virtually simultaneously: (i) a uniform data structure enables footprinting all products and services by looping the same algorithm; (ii) concurrent uncertainty analysis guides practitioners to gradually improve the accuracy of only those data that materially impact the results; and (iii) a predictive model generates estimated emission factors (EFs) for materials, thereby eliminating the manual mapping of a product or service's inventory to EF databases. These autogenerated EFs enable non-LCA experts to calculate approximate CFs and alleviate resource constraints for companies embarking on large-scale product carbon footprinting. We discuss implementation roadmaps for companies, including further road-testing required to evaluate the effectiveness of the approach for other product portfolios, limitations, and future improvements of the fast footprinting methodology. What's the carbon footprint of …? at the Guardian, drawing on Mike Berners-Lee's book How Bad Are Bananas? The Carbon Footprint of Everything. When you’re outside, show current temperature and pollution data. That’s not climate, but it’s useful and it’s related, and anyone wearing this app will be smart enough to know the difference and won’t say “Haw haw, where’s your global warming now?” if there’s a snowstorm in January or a cool breeze chills the evening air in July. 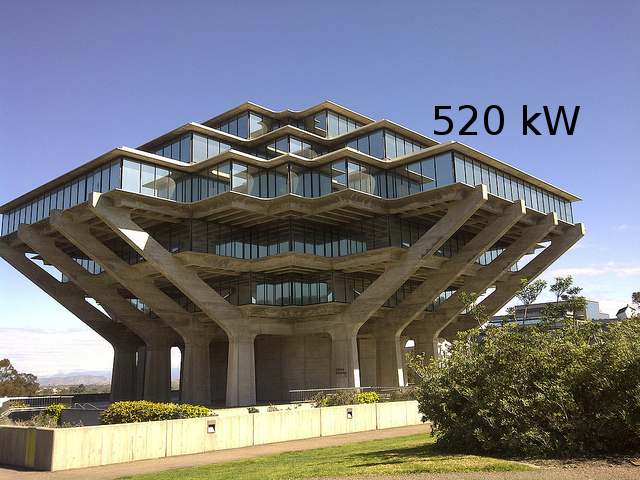 Show a building’s energy use and greenhouse gas emissions right on the building. If I was walking around UCSD I’d love to see data like this overlaid on the buildings there. Even more, I’d like to see it at York University, where I work! We use PowerLogic’s ION Enterprise Energy Management system. It measures power usage by building and sometimes by units within buildings. It’s possible to get data feeds from an API, but we’re not running it yet. Float numbers and data visualizations all around you showing where power is coming and going. In Canada any source emitting over 50,000 metric tonnes of greenhouse gases must report to the government. 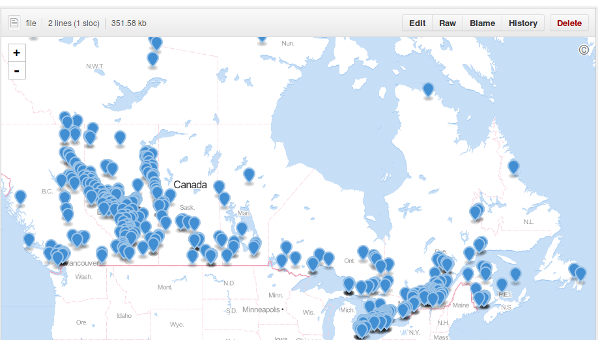 The data is available on the government’s web site, but it was awkward to deal with, so I munged some of it a bit and put the results on GitHub so I could take advantage of how it maps GeoJSON. Whenever you’re near a major greenhouse gas emitter, show it. If you can get more information about the source and company and purpose, show it. Show how the climate where you are is changing. Even in the face of the Conservative government’s sustained attack on science in Canada Environment Canada is publishing data such as the Climate Trends and Variations Bulletin - Annual 2012. The national average temperature for the year 2012 was 1.9°C above baseline average (defined as the mean over 1961-1990 reference period), based on preliminary data, which is the 5th warmest observed since nationwide records began in 1948. The warmest year on record was 2010 when the national average temperature was 3.0°C above the baseline average. The coolest year on record was 1972 when the national average temperature was 1.9°C below the baseline average. As the temperature departures map below shows, all of the country had temperatures at or above the baseline average this year, with most of the Northwestern Territories, Nunavut, Ontario, Quebec and Newfoundland experiencing temperatures more than 2°C above the baseline average. Data on how temperatures have shifted up over the past decades is available for regions all over the world. Show it so you know that this year it’s about two degrees (in my case) hotter than it used to be. What would be the best way to show this kind of information in an AR view? Visualizations have been made like this for coastal areas all over the world. That’s not augmenting reality, though. Greenhouse Glasses will show the water lapping around your ankles wherever sea level rise will be noticeable. 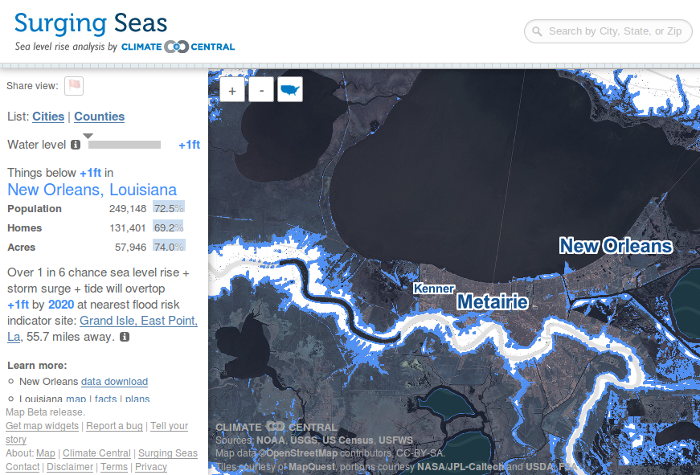 Take the low and high ends of the best estimates for sea level rise by 2100 . When you’re near the coast, the app will know, and it will also know your altitude. Subtract the sea level rise. Any height left over, show that amount of water around your feet. Maybe you’ll be walking over just a thin sheen or maybe you’ll be wading through it up to your knees. Apply the same view inside buildings to see how they’ll be affected. Optional accessory: augmented reality mould on the walls. In areas that will be affected by drought, show it somehow, perhaps by replacing the ground with dead crops or cracked dried mud. Greenhouse Glasses would have augmediated interventions like this everywhere. All kinds of company logos are ripe for this treatment. Why see them as they are? Why not replace them with something else, like a data visualization or a picture of a leaking oil pipe? Or a kitten, if you’re having a bad day. Election signs would be very different through Greenhouse Glasses. Find out who’s giving money to candidates (for an American example, see the data on Koch Industries at OpenSecrets) and overlay that on the signs. Next time you pass by a Whole Foods, see “Climate change is perfectly natural and not necessarily bad” – CEO John Mackey overtop the sign. Show art. Surprise the user. I’m Canadian, so comparing my country’s per capita emissions to America’s, and me to an average Canadian or American, is reasonable. What does it mean to compare Canada to Bangladesh or Qatar, or me to someone who lives in either? I don’t know. I picked them because I knew the first would have very low emissions and the second high. Considering all the aspects of such a comparison is beyond this post, and me. What I wouldn’t want in comparing me to other Canadians, or to Americans, or to people I know, or people who sign up for some kind of GHG-measuring service, is to go all-out into gamification (“Exclusive Gamification Sponsor: BadgeVille”). I get a little badge if I lower my emissions by 10%, or I get a Public Transit badge for taking the subway to work, or a Bird-Friendly badge for buying (or not) some certain kind of coffee. I get some badges, you get some badges, we all get some badges and we post them on Facebook and Twitter. Gamification doesn’t do anything for me. But if it works for this and supports the larger goal of preventing catastrophic climate change, fair enough. Climate change isn’t a game, though. It’s droughts and floods and heat waves and worse. Greenhouse Glasses also aren’t meant to be a personal measuring tool or quantified self app. They will measure and display, but the point is not just to keep track of your carbon footprint but to understand what is going on in the world around you scientifically, socially and politically. If you’ve read Evgeny Morozov’s excellent book To Save Everything, Click Here then you’ll recognize these lines of thought. What I’m describing involves a lot of data, a lot of measurement, a lot of personal information (it’s your own business what products you look at in a store), all of which means a lot of privacy problems. Especially when we know that the NSA and related spy agencies can get at anything they want. Surveillance culture is leaky. Primary measurements beget chains of reasoning and implication. Second and third order conclusions can be drawn by clever observers and unintended consequences are the order of the day. That’s how we end up with stories of Target outing pregnant teens to their parents through the ultra-empathetic medium of coupons. The same forces that make copyright untenable make surveillance inevitable. Computers are copying machines. They make copies of everything, including every action that you take within their field of sensation. Historically, that’s meant the things that happen online, with the main avenue of input being keystrokes. But as we wire up the rest of the planet with cameras, accelerometers, potentiometers, microphones, thermal sensors, pressure plates, and switches, that means the computer and corporate gaze will reach everything, everywhere, always. I don’t have an answer for this problem. Greenhouse Glasses show how climate has already changed, how it will change more, what the future will look like, what role you play, how you can might change your behaviour, and how the situation is being manipulated socially and politically. They inform, enlighten and surprise. They are science and they are art. They make you more aware of and more connected with the world around you, and give you a better understanding of how everything is working, from power plants to political lobbying.